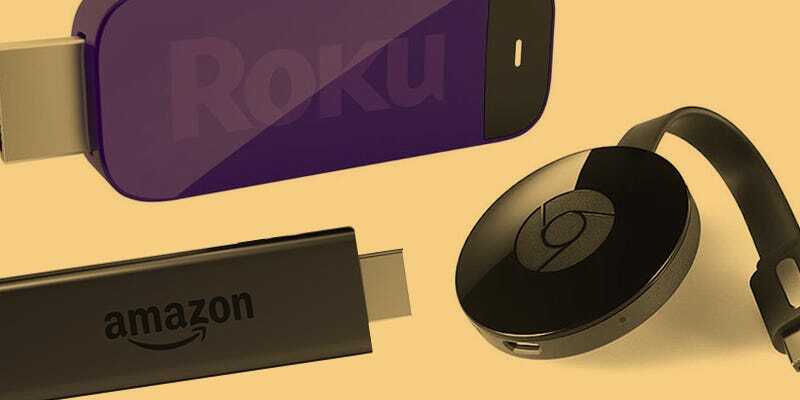 There’s a new Chromecast in town and Amazon’s Fire TV Stick is getting an update — which means it’s time for another streaming showdown. Roku’s stick hasn’t been updated since last year but we’re still throwing it into the face-off. For the sake of matching up the best, we’re comparing Roku’s HDMI version of its streaming stick. It has an HDMI connector on one end and a micro-USB (for power) on the other. The stick supports dual-band wifi and comes with a simple remote. The new and improved Chromecast dongle has finally joined the dual-band wifi crew, a much needed improvement from the older version. Chromecast’s upgrade features a different type of body style (it’s basically a circular disk) and an HDMI-out connected by a flexible cord. The dongle also relies on a micro-USB for power. The new Fire TV Stick really isn’t going to be changing that much, but last time around it was the powerhouse of the streamers. Set to release in late October, the new stick offers an HDMI connector, dual-band wifi support and also needs the micro-USB adapter to be plugged to an outlet if your TV doesn’t supply power (just like the rest). The spec that really sets these three a part is the internal storage. The Roku and the new Chromecast only have 256MB of storage and 512MB of memory, but the Fire TV Stick has a whopping 8GB of storage and 1GB of memory. Each of these devices works—it puts internet stuff on your TV!—but depending on what you’re used to, the streamers’ remotes (or lack thereof) could sway you toward one versus the other. For example, both the Roku Streaming stick and the Fire TV Stick have remotes. If you dig simplicity, the Roku’s probably going to suit your needs. The remote is extremely minimal in terms of the layout—and lack of buttons—plus it features four shortcut buttons that will take you straight to Netflix, Amazon, Google Play or Rdio. The Fire TV Stick’s remote is also very minimal, but rather than having buttons that’ll take you to apps, for $50, you can get a remote that listens to you. Amazon’s has added voice search (a.k.a. Alexa), previously only on the Amazon Echo, to its Fire TV stick. With Chromecast there is no remote included. Instead you use apps on your mobile devices to control what you watch. It’s not a deal breaker—I mean, most people have their phone handy any way while they’re watching TV. But you might want to keep a charger somewhere near where you sit. Now that some time has passed the library of apps available to all three devices has grown quite a bit, so there are few holes in programming. Gaming on the other hand does put more distance between these competitors. The Fire TV Stick has supported games for a while now, but the remote doesn’t really lend itself to playing them that well. Pick up Amazon’s $50 game controller, though, and you’ll be in business. Even though Amazon’s product is built around games more aggressively, Chromecast made a big push to get its device into the gaming scene too. It works by streaming games (even multiplayer ones) from your smartphone or tablet to the screen. You could also pair up a controller to your device—but it’s getting pretty clunky at that point. Roku offers some games, but there aren’t very many, and gaming really isn’t the focus on this gadget. The not terribly necessary, but sometimes handy mirroring option is still Chromecast’s silent win. Mirroring is when you cast whatever is on one screen to another screen. In this case, that could be you using Chromecast to toss what’s on your Android tablet to your 60 inch TV. Since you’re already using a smartphone or tablet to control the Chromecast, mirroring is simple and—like I said before—sometimes handy. The price spread isn’t very far for these three competitors. The Chromecast is the cheapest option at $35, the same price as the old Chromecast. The Fire TV Stick without voice search is $40. But with voice search the price hops to $50, which is the same cost as the semi-outdated Roku Streaming stick.